A 650-million-year-old underwater reef, 10 times higher than the Great Barrier Reef, has been discovered in the middle of Australia's outback. The ancient reef, formed nearly 100 million years before the first known animal life evolved, is the only one of its age in the world. Scientists believe it may hold evidence of the earliest examples of primitive animal life. 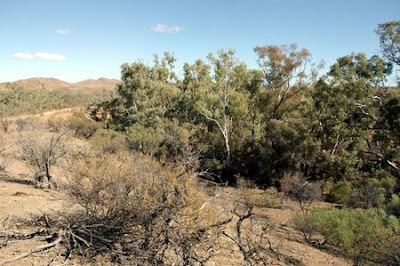 The reef was discovered by three Melbourne scientists in the Northern Flinders Ranges in South Australia. Formed hundreds of millions of years before dinosaurs roamed the earth, it existed for five to 10 million years in a tropical period sandwiched between two ice ages. The scientists, from the School of Earth Science at Melbourne University believe the reef could also explain the extent of climate change in earth's early history. "Some of the complex organisms we have seen in the reef have never been discovered previously," associate Professor Malcolm Wallace, told The Times Online. "There is nothing like these fossils in any modern setting but they have structures that are similar to some animals." The oldest known animal fossils are 570 million years old. The Flinders Ranges reef is 80 million years older than that and was, he said: "The right age to capture the precursors to animals." "With the movement over millions of years on Australia's tectonic plates, the reef has been turned 90 degrees skywards from its once horizontal position," said Professor Wallace's colleague Jonathan Giddings. "This has exposed the whole depth of the reef. These tectonic forces have resulted in very ancient history being pushed up to the present. 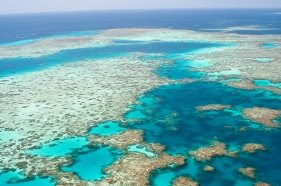 "Today's advances in satellite imagery are helping us to see the reef very easily," he said. "Geologists had seen this mass before but had not really recognised it as being once a reef." "This reef is much too old to be made of coral, " said Professor Wallace. "It was constructed by microbial organisms and other complex, chambered structures that have not been discovered before." The escarpment of the reef would have been 1100 metres at its highest point, ten times higher than the 100 metre high escarpment of the Great Barrier. The section of the reef that has been preserved is 20 km wide, but there is evidence that it extended across around 100 kilometress, comparable to the Great Barrier which stretches for 2,600 kilometres.